Stockholm is located on Sweden's east coast, where the freshwater Lake Malaren — Sweden's third largest lake — flows out into the Baltic Sea. The central parts of the city consist of fourteen islands that are continuous with the Stockholm archipelago. The geographical city centre is situated on the water, in Riddarfjarden bay. Over 30% of the city area is made up of waterways and another 30% is made up of parks and green spaces. The cobblestone streets and ochre-colored buildings of Gamla Stan (the old town) are home to the 13th-century churches, palaces and homes. Three of my friends and me extended our trip for 4 days to explore Stockholm and few of its neighbouring islands and towns. 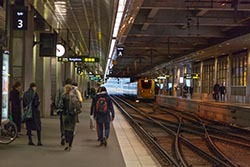 We took a train from Copenhagen to Stockholm central station. The 5-hour journey took us through beautiful countryside and over the iconic Oresund Bridge. The bridge is a combined railway and motorway bridge across the Oresund strait between Sweden and Denmark. The bridge runs nearly 8 kilometres (5 miles) from the Swedish coast to the artificial island Peberholm in the middle of the strait. The crossing is completed by the 4-kilometre (2.5 mi) Drogden Tunnel from Peberholm to the Danish island of Amager. The Oresund Bridge is the longest combined road and rail bridge in Europe and connects two major metropolitan areas: Copenhagen, the Danish capital city, and the Swedish city of Malmo. At about 5:30 PM we reached Stockholm. For our stay, we were booked at Sheraton Stockholm Hotel. It was conveniently located only a few minutes’ walk from the station, overlooking the waters. Post check-in, we walked for a while on the famous Vasagatan Street, ate at an Indian restaurant and thereafter spent some time at the Cosmopol Casino. For the casino, all guests need to carry a photo-identity and there's an entry charge of SEK 60 per head. If you plan to visit more often, it would be a good idea to enroll as a member that will give unlimited access. We did that as we would be in Stockholm for 4 nights. For our exploration of the city, we divided our next day in 2 parts. The first half would be by boat and the second half by foot. The combination, we believed, will make for a safe bet. There are many options for boat trips... from an hour long to a couple of days. We opted for a 2-hour-something boat trip named "Under the Bridges of Stockholm". 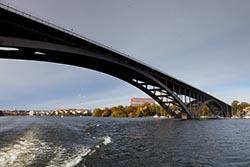 The ride would take us under 12 bridges and pass through 2 locks connecting the Baltic Sea with Lake Malaren. We chose to be Stromma of Stockholm Sightseeing. The cost for the ride was SEK 280 per head. Bit steep, but then you are in Stockholm... the Scandinavian region is expensive. The boat would depart at 11 AM from Stromkajen, near Grand Hotel. It would be a good 25-minute walk from our hotel. Post breakfast, we walked along the waters on Stromgatan passing by Gustav Adolfs Torg; Royal Opera House and Karl XII Torg. Gustav Adolfs Torg is an important public square of Stockholm. Gustav II Adolph was the King of Sweden from 1611 to 1632 who is credited for the founding of Sweden as a great power. He led Sweden to military supremacy during the Thirty Years' War, helping to determine the political as well as the religious balance of power in Europe. He was formally and posthumously given the name Gustavus Adolphus the Great. He is often regarded as one of the greatest military commanders of all time, with innovative use of combined arms. His most notable military victory was the Battle of Breitenfeld (1631). With a superb military machine, good weapons, excellent training, and effective field artillery, backed by an efficient government that could provide necessary funds, Gustavus Adolphus was poised to make himself a major European leader. He was killed a year later, however, at the Battle of Lutzen (1632). The Kungliga Operan or Royal Opera House is Sweden's premier stage for opera and ballet. 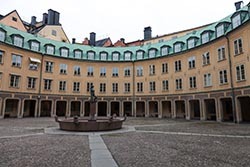 It was built in the nineteenth century at the Gustav Adolf square, the site of Stockholm's first opera house. The foundation for the opera in Sweden was laid by king Gustav III, a playwright and patron of the arts. The first opera performances were held in 1773 in Bollhuset (Ball House). In the nineteenth century, after the Gustavian Opera House was demolished in 1891, a new theater was built at the site. 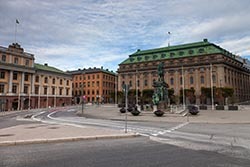 The neoclassical building was designed by Axel Anderberg who ensured its exterior was in harmony with the architecture of the nearby Royal Palace. The Opera House opened in 1898 with a performance of Franz Berwald's Estrella de Soria. Karl XII's square forms the southern part of Kungstradgarden. Here is the statue of Karl XII by Johan Peter Molin, unveiled at the 150th anniversary of Karl XII's death on November 30, 1868. 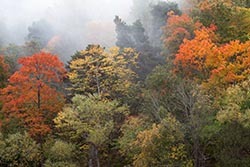 He wears a coat and points eastward. At the site of the square stood from the 1630s to 1825 the baroque palace Makalos. Just across the garden stood the majestic Grand Hotel as also the ferry pier. We set sail, as scheduled, at 11 AM. The next 2 hours we would witness the city by the waters and its many monuments. The Vasa Museum is a maritime museum located on the island of Djurgarden. The museum displays the only almost fully intact 17th century ship that has ever been salvaged. The 64-gun warship Vasa sank on her maiden voyage in 1628. The Vasa Museum opened in 1990 and, according to the official web site, is the most visited museum in Scandinavia. Together with other museums such as the Stockholm Maritime Museum, it belongs to the Swedish National Maritime Museums. Kastellet is a small citadel located on the islet Kastellholmen. The first fortification on the location was built in 1667 designed by Erik Dahlbergh. It exploded in June 1845 and subsequently a new one was built in 1848 to the design of architect Fredrik Blom. It consists of a round tower with red brick walls and a 20 meter high stair tower. On the top flies the Military Ensign of Sweden, it is hoisted and lowered every day, indicating the nation is at peace. Ports of Stockholm handles the Hammarby locks. 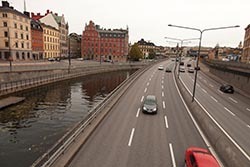 They are located in connection with the Skansbron Bridge which has vertical clearance of about 12 feet. Most of the municipalities around Lake Malaren take their drinking water from the lake. 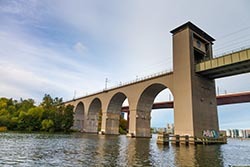 In order to prevent sea water from the Baltic entering Lake Malaren and in order to save water, the water level of the lake is regulated by opening and closing various sluice gates in Stockholm and Sodertalje. Lake Malaren is regulated when the water level sinks below or rises to a certain level above the west lock sill in the Karl Johan Lock. The normal water level for Lake Malaren is 4.14 metres above the lock sill. When the water level is below 4.10 metres, all sluice gates and other draining points in Sodertalje and Stockholm are closed. When the water level exceeds 4.10 metres, the sluice gate at Riksbron is opened. After that the various draining points are opened in this order: the Stallkanal gate, the gate in the draining channel by Karl Johan’s Square and lastly the gate in the Karl Johan Lock. If the water level is higher than 4.60 metres above the lock sill, draining is started at the locks in Hammarby and Sodertalje. If the water level in the Baltic is higher than that in Lake Malaren, all gates have to be closed. Sea water must not enter Lake Malaren. Norr Malarstrand (Swedish for "Northern Shore of Malaren") is a street on Kungsholmen in central Stockholm. 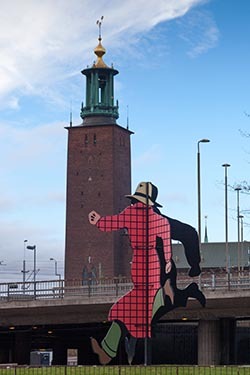 Bordering Riddarfjarden, the eastern-most bay of Lake Malaren, Norr Malarstrand is a southbound boulevard stretching 1.4 km west from the Stockholm City Hall to the southern end of the street Sankt Eriksgatan. The most notable structures along the street are the series of functionalist residential buildings lined-up along its western part. The park facing the waterfront south of the street is popular for walks. The Stockholm City Hall is the building of the Municipal Council. 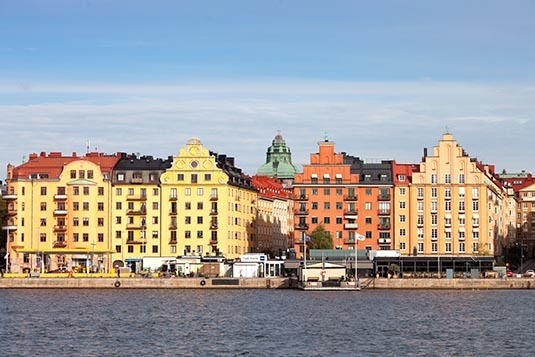 It stands on the eastern tip of Kungsholmen Island, next to Riddarfjarden's northern shore and facing the islands of Riddarholmen and Sodermalm. It houses offices and conference rooms as well as ceremonial halls, and the luxury restaurant Stadshuskallaren. It is the venue of the Nobel Prize banquet and is one of Stockholm's major tourist attractions. 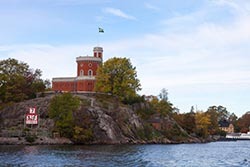 Langholmen is an idyllic island, popular spot for picnics, swimming, and recreation for Stockholmers and visitors alike. But this wasn’t always the case. From the eighteenth century until 1974, Langholmen was a dreaded prison island. The old prison has become a popular hostel with a prison museum. There are also beaches, open-air stages, charming buildings and a nice allotment garden area on Langholmen. The island is also home to Malarvarvet, one of Stockholm’s oldest shipyards, and a small Bellman museum with a cafe. Back at the terminal, we then decided to walk for the rest of the day. From the terminal we could see the Royal palace – our next stop. 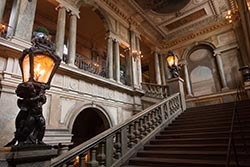 This combination of royal residence, workplace and culture-historical monument open year round to visitors makes the Royal Palace of Stockholm unique amongst Europe's royal residences. The palace is built in baroque style by the architect Nicodemus Tessin and is formed as a Roman palace. The palace has more than 600 rooms divided between eleven floors with a state apartment facing the city and smaller living rooms facing the inner courtyard. Although extensive excavations of the area around the Royal Palace in the late 1970s revealed traces of timber structures dating back to the 10th century, most believe the medieval fortress built by Birger Jarl to protect Lake Mälaren in the 13th century was the first palace to stand on this ground. That fortress eventually grew into a castle named Tre Kronor (Three Crowns) after the three crowns topping the tower’s spire. One of the few sections of that original palace remaining today is the north wing, which features a Baroque facade behind which you’ll find medieval towers. 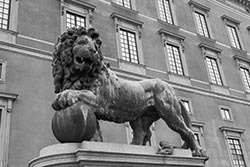 It's very much worth buying an entry ticket that gives access to The Royal Apartnents, The Treasury and the Riddarholmen Church. The Royal Apartments at the Palace are a collective name for the magnificent state rooms that are used at The King and Queen's receptions. There is a banquet hall used at gala dinners, cabinet meetings, and parliamentary evenings. There is also a guest apartment used as a guest residence for foreign dignitaries on official state visits. 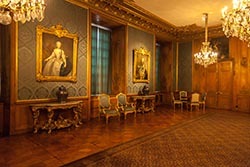 The Bernadotte rooms are used at medal presentations and formal audiences. 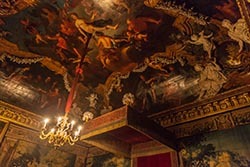 The Treasury is housed in the dark cellar vaults at the Royal Palace the Monarchy's most important symbols – the Regalia – are kept in safe-keeping. See fascinating and exclusive art, steeped in exciting history. The Regalia are the symbolic objects that The King or Queen are presented with by the Archbishop on coronation day. 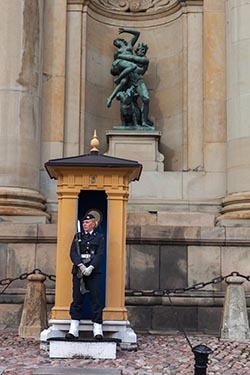 The oldest preserved objects are two swords of state belonging to Gustav Vasa that are exhibited in the Treasury's inner sanctuary. The oldest preserved crown belongs to Erik XIV. Several of The Princes and Princesses' crowns are also on view as well as the silver baptismal font from 1696, which is still used at royal baptisms. It is this collection of invaluable objects that still nowadays is regarded as The King's regalia. This means that some of them are used today on ceremonial occasions such as coronations, christenings, weddings and funerals. Unfortunately, photography was not permitted at The Treasury. A 10-minute walk from the Royal Palace brought us to the Riddarholmen Church. The Riddarholm Church is the burial church of the Swedish monarchs. The congregation was dissolved in 1807 and today the church is used only for burial and commemorative purposes. 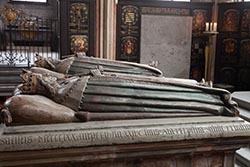 Swedish monarchs from Gustavus Adolphus (d. 1632 AD) to Gustaf V (d. 1950) are entombed here (with only one exception: Queen Christina who is buried within St. Peter's Basilica in Rome), as well as the earlier monarchs Magnus III (d. 1290) and Charles VIII (d. 1470). 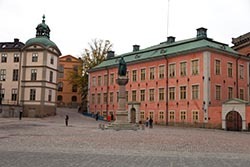 It has been discontinued as a royal burial site in favor of the Royal Cemetery and today is run by departments of the Swedish Government and Royal Court. The church is one of the oldest buildings in Stockholm, parts of it dating to the late-13th century, when it was built as a greyfriars monastery. After the Protestant Reformation, the monastery was closed and the building transformed into a Protestant church. A spire designed by Willem Boy was added during the reign of John III, but it was destroyed by a lightning strike on July 28, 1835 after which it was replaced with the present cast iron spire. Coats of arms of knights of the Order of the Seraphim are on the walls of the church. When a knight of the Order dies, his coat of arms is hung in the church and when the funeral takes place the church's bells are rung without pause from 12:00 to 13:00. 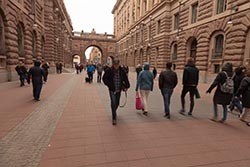 All of Gamla Stan and the adjacent island of Riddarholmen are like a living pedestrian-friendly museum full of sights, attractions, restaurants, cafes, bars, and places to shop. 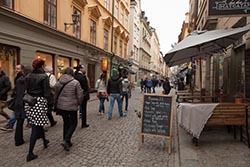 Gamla Stan is also popular with aficionados of handicrafts, curious, and souvenirs. The narrow winding cobblestone streets, with their buildings in so many different shades of gold, give Gamla Stan its unique character. Even now cellar vaults and frescoes from the Middle Ages can be found behind the visible facades, and on snowy winter days, the district feels like something from a storybook. Vasterlanggatan and Osterlanggatan are the district’s main streets. The city wall that once surrounded the city ran inside these streets along what is now Prastgatan. In the middle of Gamla Stan is Stortorget, the oldest square in Stockholm. Stortorget is the central point from which runs Kopmangatan, the oldest street in Stockholm, which was mentioned as early as the fourteenth century. Marten Trotzigs grand (Marten Trotzigs alley) is hard to find. It’s the narrowest alley in Gamla Stan, only 90 centimeters wide at its narrowest point. With enough of walking for the day, we reached our hotel, rested for a while and were ready for dinner and for the casino. The next morning we would head to Uppsala.